On February 1, 1915, John H. Delaney, Commissioner of the New York Department of Efficiency and Economy (NYDEE), released a report roundly condemning the New York State Training School for Girls in Hudson. Financial extravagance, barbarous disciplinary practices, and an unfit superintendant were among the charges leveled against the Training School. The report also contained controversial recommendations to solve these problems. John H. Delaney in a portrait that appeared in the New York Times on November 20, 1938. This report, which we shall refer to here as the “Delaney Report”, and reactions to it, will be the subject of a multi-part series on the Prison Public Memory blog. This overview is the first entry of this series. The 933-page report was officially entitled, “Annual Report of the New York Department of Efficiency and Economy Concerning Investigations of Accounting, Administration and Construction of State Hospitals for the Insane, State Prisons and State Reformatory and Correctional Institutions.” It reported the results of a three-month investigation of the policies, practices, and prospects of 24 institutions, including 14 mental hospitals and 10 penal facilities. Seven of the 10 prisons or reformatories were for the confinement and training of boys or men. 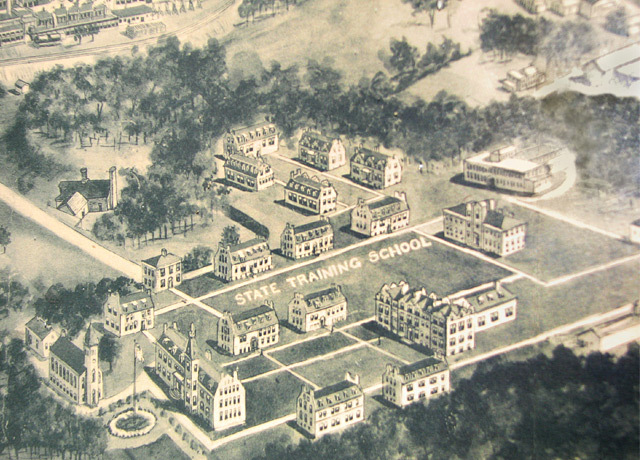 Three of the facilities were designed for women or girls: the Prison for Women at Auburn, the New York State Reformatory for Women at Bedford Hills, and the Training School for Girls at Hudson. The Delaney Report opens with 14 pages of 23 photographs that appear elegant and stately in comparison to the mental health and prison facilities we are familiar with today. But the purpose of these photographs, which were taken by NYDEE staff members, was not to display exemplary architecture or design, but rather to highlight certain of the report’s criticisms of these institutions: dangerous, expensive, extravagant, inefficient, poorly designed, overcrowded, unsafe, unsuitable, and wasteful. NYDEE was established in May 1913, but staff was not in place until January 1914 because of delays in the implementation of civil service exams and eligibility lists. Chief examiner Jackson and his “squad of accountants” start off their 17-page assessment with criticism of the facility’s school building, which they find “far beyond the requirements of the present school.” As in assessments of other facilities, Jackson and his staff examine the physical structure of buildings, the suitability of particular buildings for specific purposes, the daily lives of girls living in these buildings, the quality and dietary value of the food fed these girls, and the nature and quality of various educational, industrial, and disciplinary training. The current Superintendent is not capable of running the institution as a school, and not as a prison, and should be replaced.